We suggest that companies interested in implementing Performance-based Hiring company-wide start by assigning key personnel to participate in the Coach/Facilitator/Admin learning program. This involves a series of weekly follow-up sessions as participants learn and apply the course materials. Contact us directly for more information on how to implement this program at your company. The benefits of Performance-based Hiring have been well established. However, it’s important to have expert users in the company to ensure high adoption rates and successful implementation. This the role of the Coach/Facilitator/Admin role. In some cases, one person handles all of these roles but sometimes it’s better to split them organizationally to achieve better results. An Admin is essential for signing up users, tracking performance and organizing weekly sessions. A Facilitator is very familiar with the course materials, can answer basic questions and lead course debriefing sessions. A Coach can implement the tools and techniques covered in the training including preparing performance-based job descriptions, leading panel interviews and debriefing sessions, and negotiating and closing offers. Demo proof to exec team via senior level search project with hands-on training. Online and onsite Performance-based Hiring certification training. Develop expert users for The Hiring Machine to ensure adoption & success. Rollout THM mapping to actual hiring needs and track results. Modify hiring process and embed interview guides and scorecard. Monitor progress and performance. Build library of job profiles. 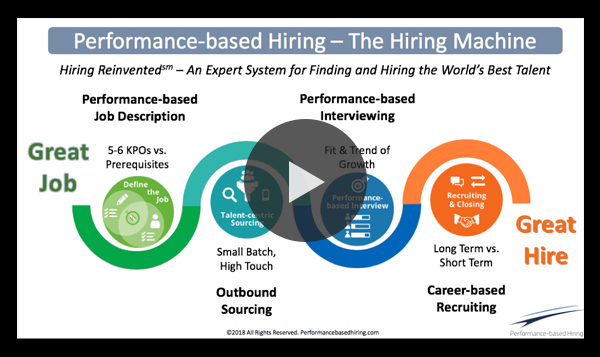 Performance-based Hiring is a registered trademark of the Lou Adler Group. Website powered by: BizzwithBuzz, Inc.